MOSCOW, Russia -- The unluckiest competitor at the World Athletics Championships in Moscow has to be Natalia Semenova, who lived up to her billing as Ukraine's "Iron Lady" by bravely competing in discus qualifying after suffering concussion and a broken, bloodied nose in a freak accident just before the event began. 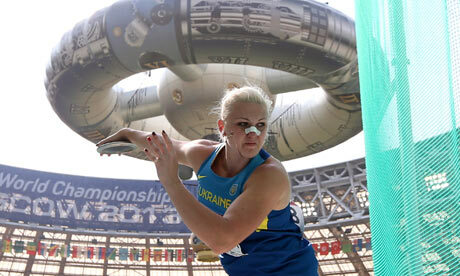 Ukraine's Natalia Semenova competes in the women's discus at the world athletics championships despite a broken nose. The European championship bronze medallist was accidentally hit in the face by Poland's Zaneta Glanc, who had mimed a throw while holding the discus, as she sat in the athletes' area next to the circle. "Coach asked me not to compete … but I had to throw to show my husband and parents watching on TV in Donetsk that I'm alive, feeling good and I'm the Iron Lady as usual," said Semenova, who finished bottom of her qualifying group after managing one legal throw. "I'm so sorry it happened to me today as I was in great shape and showed strong results in practice. I was sure I'd throw in the final." Semenova needed two stitches in a nasty-looking nose and will have to wait for five days until the swelling has gone down to find out whether she requires surgery, the statement said. Immediately after the incident, Semenova was patched up by officials under the blazing morning sun in the competition area. The 31-year-old, sporting a dressing on the bridge of her nose, continued with qualifying but managed only 55.79m, well down on her season's best of 61.41, and short of the automatic qualifying mark of 63m needed to guarantee a place in the final. Glanc did qualify for Sunday's final. "I was next to her. The Polish athlete was warming up and hit her in the face," the Olympic champion, Sandra Perkovic, said. "Her nose is broken. When I saw it, I ran over to help her. I took my towel to her and some water." After coming off the field, a clearly upset Semenova walked past waiting reporters holding a bloodied towel to her nose, pausing briefly only to say she was going for medical treatment.